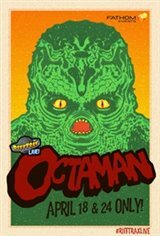 To celebrate the 10th anniversary of RiffTrax Live, Fathom Events and Rifftrax have joined forces once again to bring you Octaman! This special two-night event will be riffed live in theatres! Deep in the Mexican jungle, a legendary creature lurks in a radioactive swamp. Is it a man? Is it an octopus? No, it's OCTAMAN! Okay, it's a man in an octopus suit, but he's really angry and decides to go on a light killing spree. Directed by the writer of Creature From the Black Lagoon, and featuring costumes and effects by a young Rick Baker, Octaman is a wonderfully awful rubber monster B-movie. Join Bill, Mike and Kevin live as they risk life and limb to deliver the laughs from the clutches of Octaman!